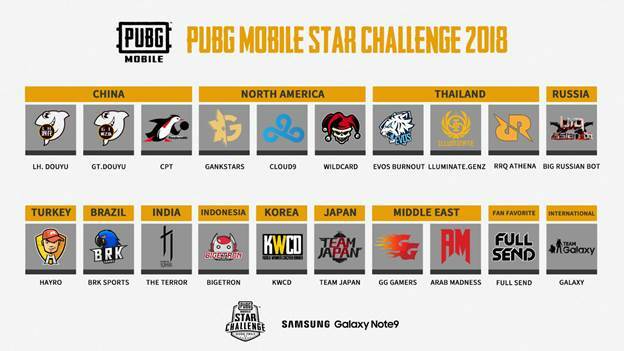 The PUBG MOBILE STAR CHALLENGE 2018 Global Finals (PMSC 2018 Global Finals) hosted by Tencent Games and PUBG Corporation (PUBG Corp.) and sponsored by Samsung Galaxy Note9 announced today the lists of finalists ahead of the start of the event on November 29th. PUBG MOBILE is the Best Mobile Game Of The Year awarded by Golden Joystick Awards 2018, that involves up to 100 players parachuting onto a remote island to battle in a winner-takes-all showdown. The PUBG MOBILE STAR CHALLENGE 2018 Global Finals is the first official competitive festival of the world’s most popular game. The participating final team list is now available, and features some of the biggest names in Esports. The Terrifying Nightmares (The Terror) are representing India at this global event. A squad of 4 friends- Sakriya Puri, Anand Puri, Mehul Dey and Amit Sharma who won the PUBG MOBILE Campus Championship held in India will battle against global giants. Viewers can catch them compete on PUBG MOBILE’s Indian YouTube channel in Hindi. PUBG MOBILE STAR CHALLENGE 2018 Global Finals is also offering two interactive areas during the event. A “Game Area” enables walk-in PUBG MOBILE matches with the winners of matches receiving a special gift and a drawing entry. The “Interactive Experience Area” enables participants to earn rewards by engaging in single events or completing all interactive contests in order to earn a stamp. Those that collect all the stamps will receive a unique customized PMSC 2018 Global Finals t-shirt and additional drawing entries. More fun is available in Samsung’s booth as well with walk-in tournament and lazer tags. The PUBG MOBILE STAR CHALLENGE 2018 Global Finals are happening November 29 through December 1, 2018 at the Festival Arena in central Dubai. Tickets to the tournament are available via https://dubai.platinumlist.net/event-tickets/72549/pubg-mobile-star-challenge and include single-day and three-day pass tickets for access to all of the action.